(1) 河野健一; 臨床における脳動脈瘤流体解析の活用, 日本機械学会流体工学部門　ニュースレター「流れ」， 2011年12月号, http://www.jsme-fed.org/newsletters/2011_12/no4.html#ctop, (2014/9/3). (2) 国立循環器病研究センター　早期・探索臨床試験拠点整備事業　［MeDICIプロジェクト］　パンフレット，http://www.ncvc.go.jp/medici/medici-pamphlet.pdf (2014/3/10). (4) Palmaz J.C., "Review of polymeric graft materials for endovascular applications", Journal of Vascular and Interventional Radiology, Vol.9, Issue 1 (1998), pp.7-13. (5) 中山泰秀，田地川勉，西正吾，"脳動脈瘤治療用の多孔化カバードステント開発における孔設計の重要性"，循環器病研究の進歩，Vol.33, No.1 (2012), pp.73-82. (6) Nishi S., Nakayama Y., Ishibashi-Ueda H., Okamoto Y. and Kinoshita Y., “High-performance self-expanding stent graft: development and application to experimental aneurysms”, Journal of Artificial Organs, Vol. 12, No. 1 (2009) pp.35–39. 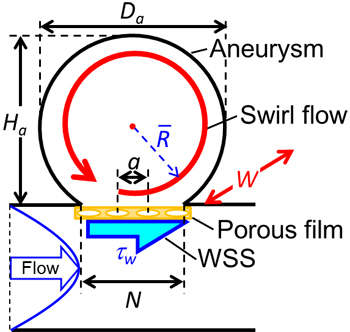 (7) Nishi S., Nakayama Y., Ishibashi-Ueda H., Okamoto Y. and Yoshida M., “Development of microporous self-expanding stent grafts for treating cerebral aneurysms: designing micropores to control intimal hyperplasia”, Journal of Artificial Organs, Vol. 14, No. 4 (2011), pp.348–356. (8) Zhao M., Amin-Hanjani S., Ruland S., Curcio A. P., Ostergren L. and Charbel F. T., "Regional cerebral blood flow using quantitative MR angiography", American Journal of Neuroradiology, Vol. 28, No. 8, (2007), pp. 1470-1473. (9) Shojima M., Oshima M., Takagi K., Torii R., Hayakawa M., Katada K., Morita A. and Kirino T., "Magnitude and Role of Wall Shear Stress on Cerebral Aneurysm Computational Fluid Dynamic Study of 20 Middle Cerebral Artery Aneurysms", Stroke, Vol. 35 (2004), pp.2500-2505. (10) Cebral J. R., Castro M. A. and Burgess J. E., "Characterization of Cerebral Aneurysms for Assessing Risk of Rupture By Using Patient-Specific Computational Hemodynamics Models", American Journal of Neuroradiology, Vol. 26 (2005), pp.2550-2559. (11) Meng H., Wang Z., Hoi Y., Gao L., Metaxa E., Swartz D. D. and Kolega J., "Complex Hemodynamics at the Apex of an Arterial Bifurcation Induces Vascular Remodeling Resembling Cerebral Aneurysm Initiation", Stroke, Vol. 38 (2007), pp.1924-1931. (12) Shimogonya Y., Ishikawa T., Imai Y., Matsuki N. and Yamaguchi T., "Can temporal fluctuation in spatial wall shear stress gradient initiate a cerebral aneurysm? A proposed novel hemodynamic index, the gradient oscillatory number (GON)", Journal of Biomechanics, Vol. 42, Issue 4 (2009), pp. 550-554. (13) Lieber B. 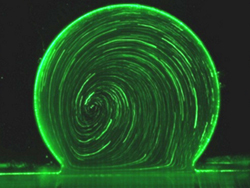 B., Livescu V., Hopkins L. N. and Wakhloo A. K., "Particle image velocimetry assessment of stent design influence on intra-aneurysmal flow", Annals of Biomedical Engineering, Vol. 30, No. 6 (2002), pp. 768-777. 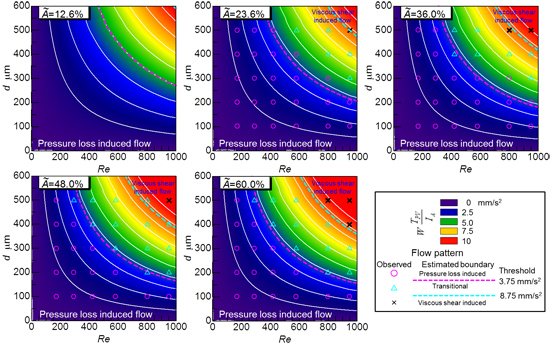 (14) Hirabayashi M., Ohta M., Rüfenacht D. A. and Chopard B., "Characterization of flow reduction properties in an aneurysm due to a stent", Physical Review E, Vol. 68 (2003), 021918, pp.021918-1 - 021918-6. (15) Meng H., Wang Z., Kim M., Ecker R.D. and Hopkins L.N., "Saccular Aneurysms on Straight and Curved Vessels Are Subject to Different Hemodynamics: Implications of Intravascular Stenting", American Journal of Neuroradiology, Vol. 27 (2006), pp.1861-1865. (16) 金子誠，小泉泰己，氏家弘，山口隆平，"ステントによる側壁脳動脈瘤内流れの可視化と閉塞現象", 可視化情報学会論文集, Vol. 33, No. 4 (2013), p. 1-6. (17) 杉本充彦, “血栓形成過程：オーバービュー”, 脈管学, Vol. 51, No. 3 (2011), pp. 275-282. (18) 貝原真, 岩田宏紀, 姫野龍太郎, “静脈血栓症発現機構に関する実験シミュレーション研究”, 理研シンポジウム　生体力学シミュレーション研究 プロジェクト第一期成果報告会 予稿集, (2004), pp.70-80. (19) 貝原真, “血栓形成と血液の流動—静脈血栓を中心に—”, 日本バイオレオロジー学会誌（B&R）, Vol. 18, No. 3, (2004), pp. 82-90. (20) Kaibara M., ”Rheological study on coagulation of blood with special reference to the triggering mechanism of venous thrombus formation”, Journal of Biorheology, Vol. 23, No. 1 (2009), pp. 2-10. 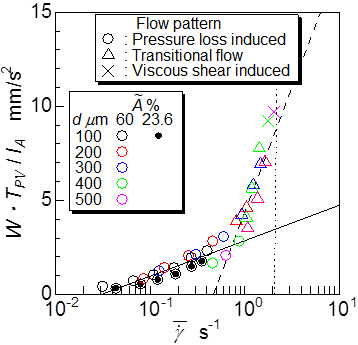 (21) Oshima M., Torii R., Kobayashi T., Taniguchi N. and Takagi K., "Finite element simulation of blood flow in the cerebral artery", Computer Methods in Applied Mechanics and Engineering, Vol. 191, Issue 6-7 (2001), pp.661-671.